It has been HOT HOT HOT around this neck of the woods so today’s kid’s activities was based around staying cool. 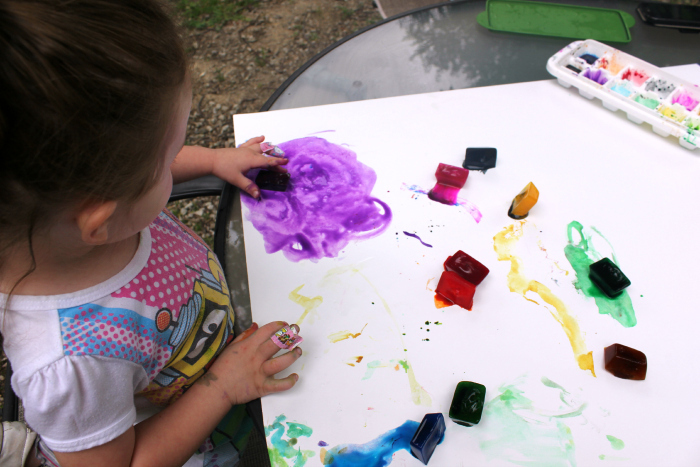 Ice Cube Painting is a great way to cool off while learning a little about color mixing and art. I actually got the supplies ready last week for our ice cube painting and waited for the hottest day yet to get the kids to painting! We decided to have a cool snack of ice cool watermelon to start our outside activities and then headed right into painting. I absolutely love working with watercolor magic when crafting and have found 100’s of uses for them. Definitely worth the cost of picking up a few bottles for crafting with your toddler. This is what we used for making the ice cube paints for this project. You will want to prepare for your ice cube painting project the night before. 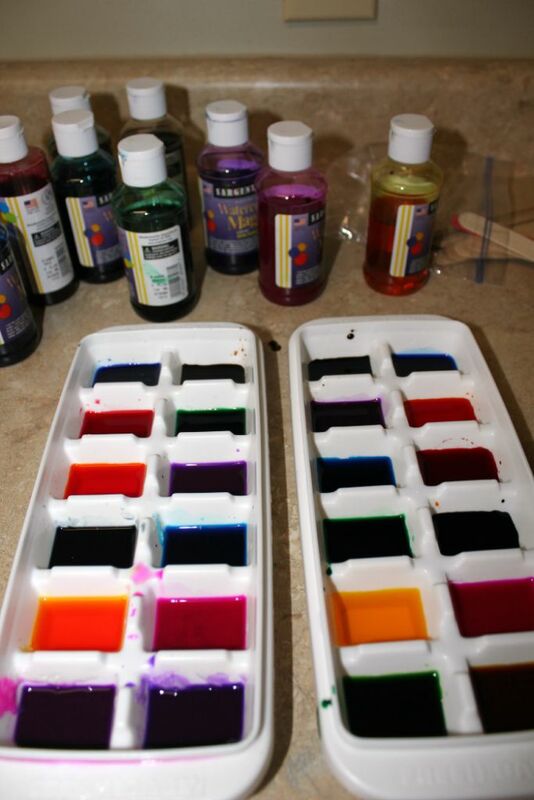 Take you liquid watercolors and pour enough paint in each ice cube whole with enough paint to cover the bottom of the tray. About 1/4 of an inch will be enough. Use a different color for each hole. Add water to the watercolor almost to the top of the ice cube tray. Don’t overfill or your colors will run together. Place in the freezer and let freeze overnight. Gather your supplies for painting and make it outside. This will make a huge mess in the house and actually it is better to play with the ice cold cubes in the heat of the day! Place your paperwork on a table and place the colored ice cubes on the paper and let them begin to explore. You can talk about hot and cold and the difference in them and also show them what happens when you mix the colors together. Some of your kiddos will really like the ice cold cubes and some will shy away. Don’t worry there is no wrong way to play with them. Just kick back and enjoy the time with the kids and try and stay cool out there! Looking for More Fun Ways to Paint Without a Paintbrush?? Here are Some Awesome Books for More Craft Ideas that I absolutely love! Art Workshops for Children – The workshops are designed to spark children’s imaginations, champion group bonding, and give visually pleasing results – with no artistic ability required. That is such a neat idea. My kids would love it. This is a great idea.I will have to try this soon when the sun decided to come back,it has gone in to hiding at the moment lol. This is one of the best projects for toddlers that I’ve seen. Toddlers love to create, and they love to be messy. This hits both of those right on the head. When it’s super hot out, we tend to stay indoors. This would be perfect for our back porch, though! I saw this done once before and thought it was such a cool idea. I may have to do this shortly with my toddler when it starts heating up again. We’ve been having lots of rain here. I’ve never heard of doing something like this. It’s so cool, my niece would love it! This looks like it could be fun for older kids too. Kiddo loves painting. Ohh! I know a couple of kids around here who would LOVE this!! Thanks! That is genius! I have never seen that before. Thanks for this art info! This is a cool idea! My grandkids would love to do this. Sounds like an amazing idea. My son would try to eat the ice though! This is such a neat idea! I have never heard of ice cube painting before. That is an awesome idea. I’m def going to try this with the kidlets! Very cool idea. Looks like a lot of fun for kids. That is so fun my kiddos would love this!!!! So simple and perfect for summer too. What a fun activity. I may have to do that with my kids before they go to school. This is such a fun idea!! I bet my little niece and nephew would love a fun project like this! This is an easy, fun, cool idea. I love it! This looks like such fun! We’ll have to try it! This is a really creative craft idea. It looks like a lot of fun! This is a super fun activity! I can’t wait to try this out with my daughter. What a creative idea! My twins would eat them right now, but I’m filing this away for a few years down the road. What a fun project! My kids would be all over this! This is such a cool idea- pun 100% intended! I will need to do this with my little ones! This is such a great idea! Davey and Isa would LOVE it! What a fun idea! My friend and I are having a camp later on in August and I think this would be a fun activity to do with the younger kids. We are also having a slip and slide, which is always a summer favourite! Messy but total FUN for the kiddos!! oh wait I want to play, too!!! Thanks for the idea. That’s a super fun way to keep cool. I’m all for artistic expression too, so this is fantastic. This is so awesome. 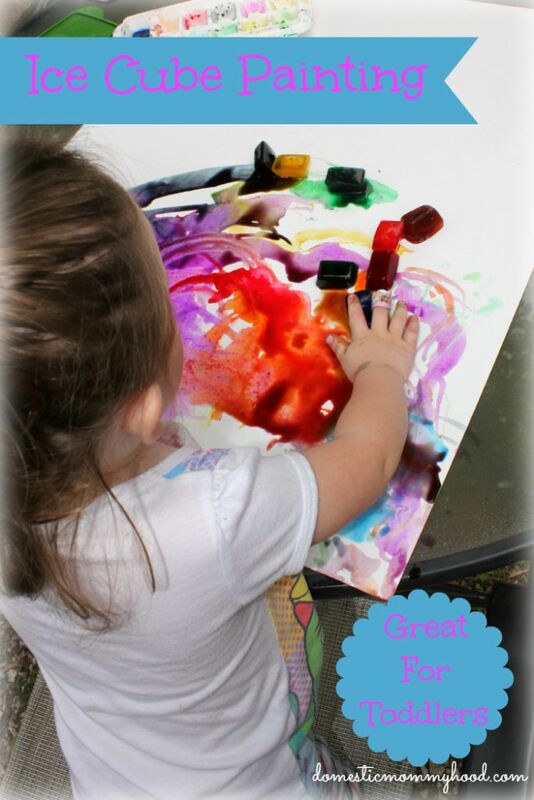 What a great way to give kids an activity to do that is fun and messy! This is extremely cool! I have never heard of something like this until now! Now my daughter and I want to try it out ourselves! Fun idea! I have never heard of mixing paint with ice. I love this idea. Thank you so much for sharing. This is so creative! The kids would love doing this … we’ll have to give it a try! What an awesome idea! I love it. Perfect for a hot summer day. what a great kids activitiy. I would have loved an activity like this when I was teaching preschool. Oh my! This looks like so much fun! My kids would LOVE this! This is such a smart idea! I am going to have to try this with my 3 year old. He would love it. Oh wow I never thought of that when my kids were little, that is such a cool idea. You could use jello too. What a neat idea! I would have never thought to freeze the paint for the kids. Too cool!! This looks like so much fun! My kids would think this was the best day!